...but Steinway is still trying hard in the face of competition to maintain its overwhelming dominance on the concert stage. think Baldwin is even in business any more. The rest are also-rans. door to FAO Schwarz...a good thing. As a piano technician since 1960, with Steinway & Sons training, and doing much concert work for the stage, people who have older Steinways fall in love with them and do their best to maintain them. Like people, pianos get old and need attention, far more than just tuning. Action regulation is essential in the performing artist to reach his artistic goals. Baldwin, Steinway's major competition, and before that, Mason & Hamlin, has held the market for performance for many reasons. And like cars, stoves, refrigerators or anything else, there can be good ones and ones not-so-good. Generally, however, you can depend on a Steinway instrument for concerts. Most times, traveling artists have only one piano at their disposal, and, depending on the maintenance of the piano, they will either like it or merely play it because there is nothing else available. Baldwin stopped manufacturing pianos pretty much because of the Asian market, and because Gibson Guitar, who bought them out (as Selmer did with Steinway at one time), were not piano makers. Baldwin was the most productive, in numbers, of pianos in the USA. Yamaha had a rough start because there early pianos would not hold up to American climate. They ARE innovators, however, just as Kawai is (especially with their Shigeru models). Helene Bechstein did NOT manufacture pianos ... it was because she married Mr. Bechstein that she took hold of the company after his demise. Indeed, she collaborated with Hitler, was his dear friend, etc., but you cannot judge the piano on that basis. Serkin and Schnabel loved Bechstein pianos, as did Edwin Fischer and so many other European and English artists. Debussy said his music should only be played on a Bechstein. I have worked on all celebrated pianos, concert- and smaller grands. I have found lemons in them all. I have also found superb instruments by all these makers. I was president of a company that sold Kawai pianos; it was one of the most trouble-free pianos I've worked on over the years. Selecting a piano is like selecting a mate. Sometimes you love them for a while, and then you may fall out of love with them. They are subject to changes from playing, heat, humidity, not playing them (using as an ornament in a home), and thus are susceptible to amazing changs over the years from pin-blocks that don't hold a tune any longer to hammers that have flat heads and don't produce proper tone to soundboards that lose their crowns, to keys that wobble, and actions that need regulation. I have NEVER found a piano that is perfect - they are man made you know, for the most part - and I'm sure if I were to inspect Auntie Lynn's beloved Steinway I could find many things that could be improved, no matter what your own technician may say. It's just the nature of the beast - and a wonderful beast it is. [André Watts once] deserted the more or less standard Steinways and Baldwins for the upstart Yamaha piano--a brand switch of memorable proportions in the concert world. Most observers thought the move was inexplicable; some thought that money might have changed hands, a rumored practice. "Haven't you heard?" Watts says now [in 1995]. "I gave up the Yamaha. I played my last concert as an exclusive Yamaha artist on Oct. 4." With quiet patience--in the piano world, this has been a subject of much speculation--Watts relates the saga: "In 1987, I was on tour in Japan. Now, I have always played the Yamaha in Japan, and I did so then. And I talked to Yamaha about being exclusive. I decided to do it. There were two reasons: first, the uniformity of the instruments"--the grand pianos that Watts then considered comparable to superior pianos of any make--"and the high quality of the service." In some venues, he says, he might call Steinway, for example, about a misfiring instrument and get the verbal equivalent of a shrug. With Yamaha, he says, "I could always count on the technicians, wherever I was traveling." Last year, Watts decided that "slowly, things had changed, so I parted company with Yamaha." Once again, it was mostly a matter of support: Yamaha no longer seemed capable of providing to Watts "the really great technicians" when he was on the road. So today, like a recently divorced person (the pianist laughs at the comparison), Watts finds himself "a free agent." "I have no solid firm commitment to any particular piano," he says. "I am playing what is available. I'm being very selfish in pleasing only myself." You should know that for the most part, the same kind of materials is used for nearly all the pianos built by reputable manufacturers. It is what is done with those parts that creates the most notable differences, especially in tone quality. Manufacturerers still used aged spruce for sound boards, the best available felt for the hammers. Most of the parts are made of rock maple for shanks/flanges, etc. The actions all do, basically, the very same thing. They sometimes adjust differently with screws and springs. Cast iron is used in the plates. In some pianos, strip material for flanges is aluminum wherein holes do not wear out (in wood they frequently do, and are subject to temperature changes causing looseness in the flanges, aluminum does not change). There is a rather hard push for selling Steinway pianos today. I walked into a store recently, out-of-town, and was not known to the store. I was greeted with: "Do you know that you are looking at the finest piano in the world?" I discovered the salesman really knew very little about the product he was trying to sell. Steinway has much competition today, particularly from Japan. Japanese technicians have proven to be highly skilled. When Steinway opened up shop in the USA, many of their German technicians came from Hamburg. They were well trained in the art (and it is an art) of making pianos. They were true craftstmen from hand-making the extraordinary cabinetry to refining action parts and making innovations then that are still in use in present-day Steinway instruments. The work force, with these dying-off artisans have little time to train the newcomers. Having worked on the top-of-the-line concert instruments for Steinway, Baldwin, Mason & Hamlin, Kawai, Bechstein, Bösendorfer, Blüthner, Grotrian Steinweg and others, the workmanship has generally been outstanding. When unions started taking over some of these companies, quality was sometimes usurped in favor of getting the pianos out in a timely fashion. I need not tell you what is often the result of this. The truly 'fine' work in piano building is left to the best technicians in the stores that sell the product, and truth be known, there are simply not enough to properly serve the industry. The best-trained ones have excellent jobs with top-flight universities and colleges and have little time to work on instruments outside of that environment. Others travel around preparing pianos for major concerts and recording companies; they are generally very highly paid and get lots of perks, but don't take too much work outside of that field. Like anything else, people have to become truly educated about pianos and know what to listen for in an instrument, how the action responds, and so much more. I can't tell you how many famous pianists I have worked for who do not really know much about the piano and what makes it tick. They either like it or loathe it but they don't know why they don't like it. Artists such as Brendel, Michelangeli, and Zimmerman know the workings of the piano and can make life really tough on the technician if the piano is not up to par. This is, of course, a great subject, especially for me who is currently in the process of rebuilding a 1922 Steinway B (used on the concert circuit for many years), which has the original Steinway-cast frame, good soundboard, and it is getting new strings, new hammers and most working parts. It has quality built into it that is not always seen in brand new instruments. Still, all said and done, Steinway remains the leader because of its long-held reputation and I believe they are building the best instruments they can. (I remember when Steinways sold at approximately $1,000/USD a foot, i.e., $9,000 for a concert grand ... yes, a long time ago. Not today, however!) 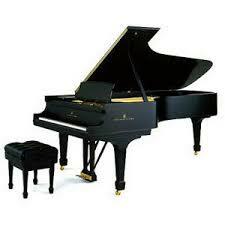 The best Kawai or Yamaha pianos carry price tags higher than Steinway. My family had a Steinway upright piano - my mother learned to play the piano as a girl, up to a point - and when I was still very young, I was started on piano lessons. To me it felt like the piano's action was very stiff, too much so for my little fingers, and since the piano was fighting me, I didn't practice much and the lessons ended. If there had been a good piano technician in Lancaster, PA, if my folks knew who he was, and if they realized what was needed, who knows? I might have learned to play, perhaps even adequately. But it just wasn't on. Nowadays, with electronic keyboards, playing can be physically almost effortless, and I've sometimes thought of buying one for whatever use I might make of it. But no, I'd probably just pile up stuff on it instead of using it. A most illuminating thread from all posters. To John F: I've been putting this off because of domicile reconfiguration delays (in plain English, this house is my mother's legacy for good and for ill), but I must have a keyboard, never having had one in my own home since childhood, and it will have to be electronic along the lines of a Yamaha Clavinova. I hate the compromise, but there is no practical alternative. A good electric keyboard that simulates a real piano has sufficient touch to keep the fingers in shape, not to mention the musical brain. This thread is utterly fascinating. Lance, it is always so interesting to learn from someone who knows so intimately from experience. Is there a thread where you have spoken of your dealings with musicians? Anecdotes have popped out here and there, but I'd really enjoy something systematic. A couple of years ago I read an interesting book by a Steinway tuner from the second half of the 20th century, it might have been Frank or Franz - I have no doubt you know the book I mean. When can we expect the same from you? The book you are referring to is by Franz Mohr with Edith Schaeffer and is entitled My Life with the Great Pianists. Much interesting information in this book. Mohr was a chief piano technician for Steinway & Sons in New York. I had the pleasure of meeting him at Steinway's 57th Street store in New York City, discussing some piano fine points, and found him to be a real gentleman who was totally dedicated to Steinway & Sons and their pianos. From time-to-time, I have posted comments about my own life as a piano technician having worked with many celebrated artists. In some cases, I have to wait for their demise before making some comments! I'm not sure if there is a "systematic" way of imparting these stories, but, of course, I have many. barney wrote: This thread is utterly fascinating. Lance, it is always so interesting to learn from someone who knows so intimately from experience. Is there a thread where you have spoken of your dealings with musicians? Anecdotes have popped out here and there, but I'd really enjoy something systematic. I have no idea who is making Steinways now...so I'll keep what I've got. It's a series G which is pretty rare and one of the best. Lance wrote: The book you are referring to is by Franz Mohr with Edith Schaeffer and is entitled My Life with the Great Pianists. Much interesting information in this book. Mohr was a chief piano technician for Steinway & Sons in New York. I had the pleasure of meeting him at Steinway's 57th Street store in New York City, discussing some piano fine points, and found him to be a real gentleman who was totally dedicated to Steinway & Sons and their pianos. From time-to-time, I have posted comments about my own life as a piano technician having worked with many celebrated artists. In some cases, I have to wait for their demise before making some comments! I'm not sure if there is a "systematic" way of imparting these stories, but, of course, I have many. Hmm, you know you got a smile out of me with that last line! I needed a smile today. Grazie. To look at me is to laugh out loud. Sorry I can't give you that pleasure. So, besides Auntie Lynn, how many of us CMGers own a Steinway piano (or a Baldwin)?